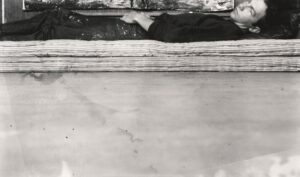 In this carefully staged photograph of the artist lying beneath one of his own canvases, the majority of the composition is devoted to the unswept studio floor, inverting the usual relationship between horizon and foreground. As Postcard Self-Portrait, Black Mountain (II) (1952) attests, Robert Rauschenberg became deeply engaged with mid-century experimental and abstract photography while studying at Black Mountain College in North Carolina between 1948 and 1952. His early explorations of the medium were influenced in part by figures such as Hazel Larsen Archer (1921–2001), who taught at the school from 1949 to 1953, and Aaron Siskind (1903–1991) and Harry Callahan (1912–1999), who were summer faculty there in 1951. 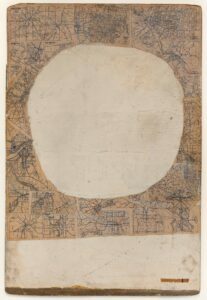 A bold mixture of double exposures, experiments with extreme light and shadow, abstraction, and the use of blueprint paper to generate photographs without a camera, Rauschenberg’s earliest experimental photographs often doubled as portraits of his closest companions and interlocutors, including fellow artists such as his then wife Susan Weil (b. 1930), Cy Twombly (1928–2011), and dancer and choreographer Merce Cunningham (1919–2009). Self-portraits were also a recurring subject. Postcard Self-Portrait, Black Mountain (I), taken the same year as its counterpart, features Rauschenberg seated in a wooden chair, hands folded, with ghostly images of chairs and weeds washing over his body. Much like that poetic multiple exposure, Postcard Self-Portrait, Black Mountain (II) explores the fleeting presence of the artist’s body within the setting of the photographic frame. Rauschenberg is compressed between an abstract painting, a set of striped mattresses, and the vast expanse of his studio floor, and his slightly blurred face and knee suggest that he triggered a timer and then raced back for the exposure, nearly missing his own portrait in the process. Awkwardly squashed between his bedding and the upper edge of the print, the artist has carefully flattened himself, allowing us to see the bottom few inches of a large painting on the rear wall, hung just above the floor. The canvas in question is one of his Black paintings, a group of works with which Rauschenberg was deeply involved when this photograph was taken. By setting his camera at an extremely low point, perhaps on the floor, Rauschenberg created a dramatically angled view in which he appears wedged into the wall of his studio, his body geologically layered between his artwork and his creative space. Robert Rauschenberg: The Early 1950s, Corcoran Gallery of Art, Washington, D.C., June 15–August 11, 1991. Traveled to: The Menil Collection, Houston, September 27, 1991–January 5, 1992; Museum of Contemporary Art, Chicago, February 8–April 19, 1992; San Francisco Museum of Modern Art, May 14–August 16, 1992; Guggenheim Museum SoHo, New York, October 24, 1992–January 24, 1993. Robert Rauschenberg: A Retrospective, Solomon R. Guggenheim Museum, New York, September 19, 1997–January 7, 1998. Traveled to: The Menil Collection, Houston, February 13–May 17, 1998; Museum Ludwig, Cologne, Germany, June 27–October 11, 1998; Guggenheim Museum Bilbao, Spain, November 21, 1998–March 7, 1999. Robert Rauschenberg, San Francisco Museum of Modern Art, May 7–September 7, 1999. Robert Rauschenberg at SFMOMA, San Francisco Museum of Modern Art, June 27–September 8, 2002 (on view June 27–July 30, 2002). Black Mountain College: Una aventura americana, Museo Nacional Centro de Arte Reina Sofía, Madrid, October 28, 2002–January 13, 2003. Treasures of Modern Art: The Legacy of Phyllis Wattis at SFMOMA, San Francisco Museum of Modern Art, January 30–June 24, 2003. 75 Years of Looking Forward: The Anniversary Show, San Francisco Museum of Modern Art, December 19, 2009–January 16, 2011. 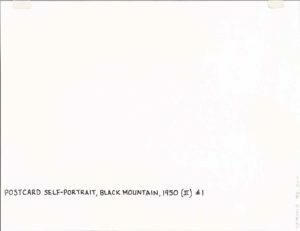 In addition to appearing in the special exhibitions listed above, Postcard Self-Portrait, Black Mountain (II) was shown in SFMOMA’s galleries in 2002 and 2009 as part of a series of rotating presentations of the permanent collection. This listing has been reviewed and is complete as of August 31, 2016. Walter Hopps, Robert Rauschenberg: The Early 1950s (Houston: Menil Foundation and Houston Fine Art Press, 1991), 62, 69 (ill.). ———, Robert Rauschenberg: The Early 1950s (Houston: Menil Foundation, 1991), 32. Exhibition booklet produced for the Menil presentation only. Fred Camper, “The Unordered Universe,” Chicago Reader, March 26–April 1, 1992, 31. Christos M. Joachimides and Norman Rosenthal, eds., American Art in the 20th Century: Paintings and Sculpture, 1913–1993 (Munich: Prestel Verlag, 1993), 94 (ill.); (German edition: Munich: Prestel Verlag, 1993), 118 (ill.). Walter Hopps and Susan Davidson, eds., Robert Rauschenberg: A Retrospective (New York: Solomon R. Guggenheim Museum, 1997), 55 (ill.). Joan Seeman Robinson, “Disappearing Act: Robert Rauschenberg,” Spot 17, no. 2 (Fall 1998): 12–13 (ill.). Vincent Katz, ed., Black Mountain College: Experiment in Art (Cambridge, MA: MIT Press, 2002), 158 (ill.). Branden W. Joseph, “The Gap and the Frame,” October 117 (Summer 2006): 60, 61 (ill.), 62–63. Janet Bishop, Corey Keller, and Sarah Roberts, eds., San Francisco Museum of Modern Art: 75 Years of Looking Forward (San Francisco: San Francisco Museum of Modern Art, 2009), 432. Nicholas Cullinan, Robert Rauschenberg: Photographs 1949–1962, ed. Susan Davidson and David White (New York: Distributed Art Publishers, 2011), 93 (ill.). Ralf Beil and Peter Kraut, eds., A House Full of Music: Strategies in Music and Art (Darmstadt, Germany: Institut Mathildenhöhe, 2012), 35 (ill.). Amy Knight Powell, Depositions: Scenes from the Late Medieval Church and the Modern Museum (New York: Zone Books, 2012), 226, 227 (ill.), 228–33. 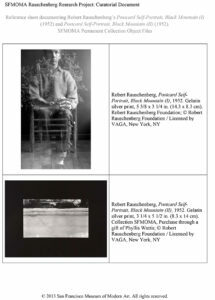 This listing has been updated since the launch of the Rauschenberg Research Project and is complete as of August 31, 2016. Note: This photograph was inscribed in the 1980s. Inscription date does not conform to recent research conducted by the Robert Rauschenberg Foundation, which confirms a date of 1952. Not on view at this time. 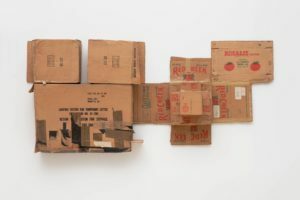 Although it is unassuming, particularly within the context of Robert Rauschenberg’s vast and ambitious oeuvre, Postcard Self-Portrait, Black Mountain (II) of 1952 is among the most evidently carefully staged works of the artist’s career. 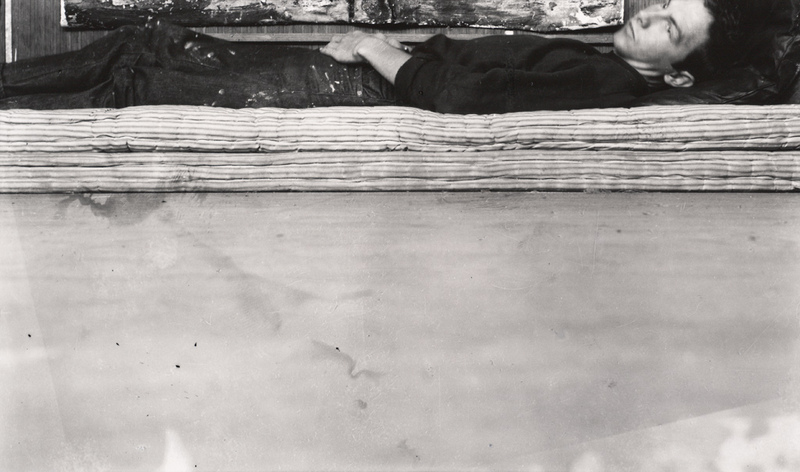 In it, an expanse of floor taking up more than half the image is topped by two thin, striped mattresses on which Rauschenberg lies in dark clothing, his head on an equally dark pillow, body tightly squeezed into the upper portions of the frame.